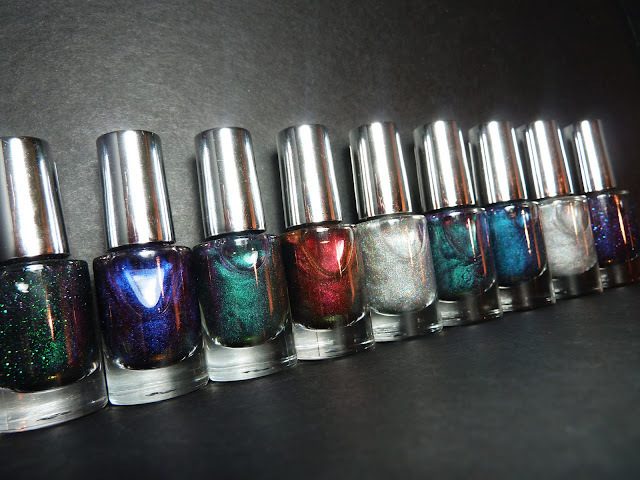 Fashion Polish: one million pagesviews + blogaversary : one month of giveaways, week 3 : Frankens!!! one million pagesviews + blogaversary : one month of giveaways, week 3 : Frankens!!! I'm sure you all know how much I love frankening. Well, since I used to have A LOT of comments, questions and requests about my Franken Friday posts, it wouldn't have seemed right to me not to include a few creations of mine in these blogaversary giveaways. If you've missed on the giveaways of week one or two, they are still open (until Dec 11th), just follow the links. I tried to include some of the most popular Frankens I made, such as Shimera, Night-Fall, Toxin, Enigma, Venom, Moonstone and a couple of exclusive shades, a dark blue to red and gold multichrome glitter or a coarse version of Moonstone with larger spectraflair. These are not set in stone, the winner will have the possibility to ask for a different franken from my previous posts and I will try my best to oblige but some like Aurora aren't available due to discontinued ingredients. You're welcom thepolishwell! I'm glad you like it. This is a really awesome giveaway, thank you, and those are beautiful frankens! I love them! Hi Sam! Thank you for the giveaway! :) just a note. I had some trouble with the entry and rafflecopter kept sayin that it was messed up and told me to try again. After refreshing the page, I realized that there are three similar entries? >< I'm so sorry! It wasn't intentional! Your Frankens are AMAZING have you put a post on your blog about how you made them, the winner will be a very lucky person! Wow! :) Venom and Night-fall are amazing! Thanks for the amazing giveaway"
Thank you for the amazing giveaway. I love the beautiful nail polishes colors. OMG! I would honestly prefer your frankens to any branded collection I've ever seen! ils sont magnifiques tes franken et n'ont rien à envier aux vernis de grande marque je trouve ! These are... GORGEOUS. A.M.A.Z.I.N.G. I could go on. thank you , these are very pretty color combinations ! I love it! What a fantastic surprise! I found out about this from Jeanette (theswatchaholic). What an awesome giveaway! I cant tell you how awesome it is to be able to enter a give away internationally! This is officialy the first one Ive ever been able to enter. Wooo! This is awesome! Love the franken polishes! This is awesome! I love the franken polishes! Wow I love this giveaway! I'm a new reader to your blog, but your frankens are amazing!! And I'm so glad you opened this giveaway to international fans as well :) Can I just ask - where do you get your empty nail polish bottles from? I'm thinking of doing some frankens but I have no empty bottles to store them! ZOMG I want....I need.....holy cowabunga! FRANKENS!! And yours are the bombdiggity!! Love your blog, love your giveaways! Go girl! Oh my...I have been lusting after your frankens for so long, I really want to win this one! Thank you! Thanks for this giveaway! I loved the polishes! Words cannot express how much I want to win this. That's probably why I won't, but I WANT TO! Your frankens are amazing, you seriously rock for doing a giveaway with them! Shimera is probably my favorite franken ever! I've tried to find something like it but nothing exsists to even being close to it! I neeeeed it! They're all amazing! Entered :D thank u so much!! Where do you get your bottles that you use to make your frankens? @Unknown I use the bottles from the Essence Colour & Go clear nail polish. Não tinha visto desses esmaltes ainda... são lindos! It is very hard to choose my favourite out of all of them, there all so beautiful! Oh my goodness..... I need those turquoise-y ones! SO lovely. You should really go into business and create your own polish line. Those are some awesome frankens!